Our starlings are not out of the nest yet, but I was at a friend's stable today, and theirs most certainly are. Although, on form to date, they should not be... When it comes to flying, they are unsafe at any speed. But you can't fault them for trying! In a group, starlings are called a Murmuration. And when we say group, we mean HUGE GROUP -- we never see them in these numbers here, just a few cleaning out the bird feeder, but this video from Marazion Marsh will give you an idea of just how huge these flocks can be. And will give you an appreciation of their amazing flight skills. We have two pairs of bluebirds here again this Spring. Love love love them... one of our very favourites, so it is always a happy day when we first see them zipping about at the garden. The males, handsome devils, are very camera shy however, and tend to zip out of range at the mere mention of a photo shoot, so I have been diligently 'stalking' them with camera in hand for about a week (since they checked in). Mostly those pics have been totally tossable, unfocused because of the distance I had to be away, but today -- aha!!! Gotcha! Our tree swallows are much more willing to pose for the camera. CBC Radio recently aired a program however that we find most disturbing. Our swallows grace our skies, skimming over the garden and fields and lake, often in synchronized flight, snapping up insects. In the past decade, according to the scientists studying them, their numbers have decreased 50%. Yes, fifty percent. That is huge, and very troubling. Their body mass has also dropped by around 10%, which is also huge for such tiny creatures. The culprit? Well, surprise, surprise.... in their winter ranges to the south, heavy use of insecticides and pesticides and monoculture crops have knocked out the food supply and habitat. The apple and wild plum trees are all coming into bloom right now as well. The tree outside my house literally buzzes with the wings of bees, and we welcome them as well. The dreadful collapse in the bee colonies is troubling in the extreme, and again is directly traceable to the use of insecticides. We, as a species on this Spaceship Earth, MUST learn different ways to live with our fellow creatures. After all, if we lose the bees, we lose our food supply. 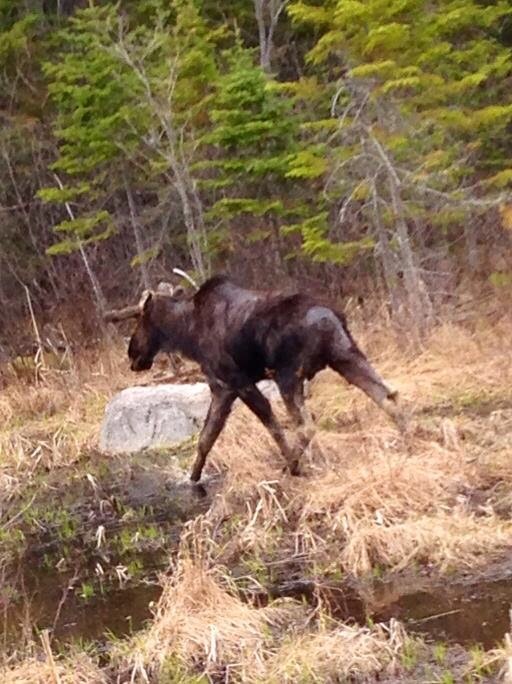 Oxtongue Craft Cabin -- what is not to Love?! Thanks for inviting us to the Open House today, Karen and Garry -- new owners at the Oxtongue Craft Cabin. This is one of the Must Stop and Shop sites on the Lake of Bays (or in the entire Huntsville/Algonquin Park area, come to that.) Whether you are looking for that little something to add to your own collection, or are on the quest for the perfect gift for any occasion, you'll find something here to entice your credit card to leap out of your pocket. These are just a few "teaser" photos of the store, to whet your appetite. Conveniently located within walking distance of Bondi, you'll probably want to bring a vehicle to help haul home your treasures. Don't miss this charming little craft store on your next swing through the Lake of Bays. In between harvesting asparagus and rhubarb, we are now being treated to the glory of the flowers coming into bloom. It's getting close to the road, however, and that's never a good thing for turtles, tiny or titanic. So the BMD swept into action and relocated the snapper to the soft beach at the lake, where there is lots of soft sand, should she want to be digging (although she looks young to be nesting) And where she is close to the water, for safety and lunch. We are big fans of snapping turtles. With their anicient expressions, and their incredible claws, and that nifty hooked beak, they haven't changed much since the dinosaurs stomped the swamps. The biggest risk to their continued existence today is the automobile... So please, everyone, Give Turtles a Brake! The Turtle Transfer Truck was fully decked out with flashing lights. Very appropriate to the solemnity of the occasion. Early morning, along the shoreline, is a magical time. Taffy found a whole other dog to talk to... that's the glory of a lake that is so mirror-still. The sand holds all kinds of animal and bird tracks, so we can see who has been around while we were sleeping. Nestling in the grass, the wood violets are now in bloom, so small you could walk right past them if you weren't looking. They are surrounded by the wild strawberries which will soon be coming into flower as well. And overhead, a pair of mourning doves were out to meet the morning, facing east and west on the overhead wire. There is always a reward to going for a wander out of doors at any time of day. Early mornings come with their own special treats. Taffy explored along the beach, where she found tracks galore. Not only from the golf cart, where the gang were picking up raking debris from the high water, abut also these tracks of Mr. Raccoon, out hunting. (Those are Taffy's toes on the right hand side, which give some scale to the raccoon's paws.) Raccoons have long delicate fingers on their front paws, the better to get into all sorts of mischief. They are a pain in the **** if you don't lock up your garbage and bird feeders, but they are really just trying to get by, like all of us. Curious creatures, they get into all sorts of places where they don't really belong. Nor are they above the occasional "photo bomb". 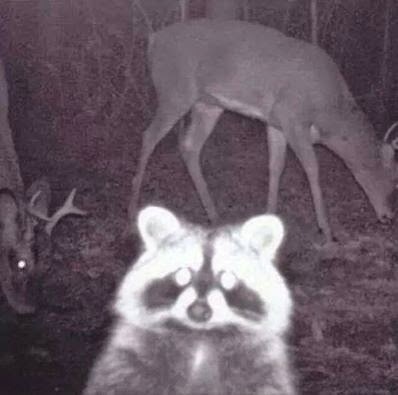 This wonderful shot was captured on a friend's Game Camera last fall. We love it! Lunch is served! There is seed and cracked corn put down for the chickens, who are ranging very freely and with glorious abandon these days. Cute goes a long way towards tolerance, and we adore the chipmunks. Friendly and cheeky, they will come right up to your hand to nibble at seeds and say hello. Who couldn't like that? The rose breasted grosbeak was also quite delighted to snap up some cracked corn. They are more usually spotted up at the bird feeders. Even the chickadees, those hardy lovely souls who tough out the northern winters at our feeders, were happy to join the chipmunk and grosbeak. The swallows did some fly-overs, but they of course aren't interested in the grain menu -- they are gearing up for the nesting season by catching as many insects as they can while in flight. This is Friday, May 23. So get yourselves to bed early enough that you can leap from the sheets about 2 a.m.
Why? You ask, pulling the duvet closer. Well, NASA says we Might have a brand new never-been-seen-before meteor shower. Earth is scheduled to slice through the debris trail of the boringly named Comet 209P/LINEAR. The thing is, we've never done that before, as an Earth, so this Could be a big thing. We won't know how big a thing until it IS a thing, but that's part of the excitement. Since we have no way of knowing how much debris 209P laid in its wake back in the 1800's when it zipped past us for the first time ever, we don't know just how much 'stuff' there is up there to turn into meteors and light up our skies. NASA, who like to hedge their bets, are giving a scale, from DUD to FIVE TIMES as big as the beloved Persied meteors that keep people up at night each August. So, while we won't guarantee that you will see something totally special, we will guarantee that you shouldn't miss the chance. Where to look? Well, the names are better here (209P/LINEAR? as a comet name? Really?) We will smack into the debris field in the region of Camelopardalis, which is lending its lovely monikor to the meteor shower, now dubbed the Camelopardalids. 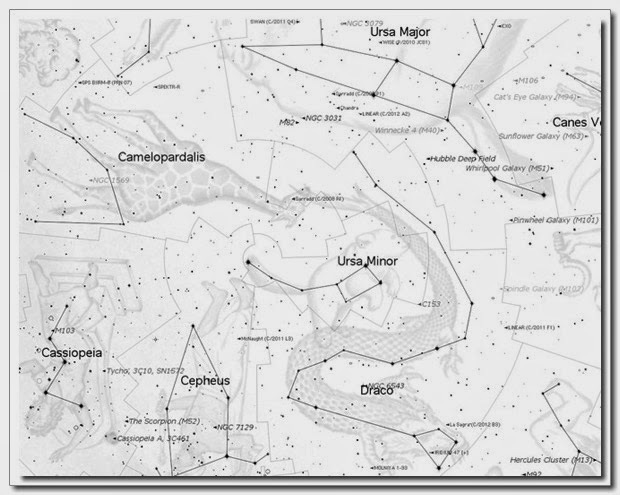 Camelopardalis, if you've never spotted this 'giraffe', lurks just below the nose of the Great Bear in the Big Dipper, so if you find the Dipper, go to the North Star, and look a little below. Heck, if it is a good meteor shower, just looking North is going to do the trick. How did we get a giraffe in the constellations? Good question, to which there is no good answer. It was first recorded in 1624 by the Danish astronomer S. Bartsch. Spelling does matter... because the myth is that this is the Biblical animal upon which Rebecca rode into Canaan. Small problem... Rebecca rode a Camel, not a giraffe. There is the possibility that the name was confused, or some letters added... Or that the shape of the constellation, which is faint and hard to see, itself produced some confusion. 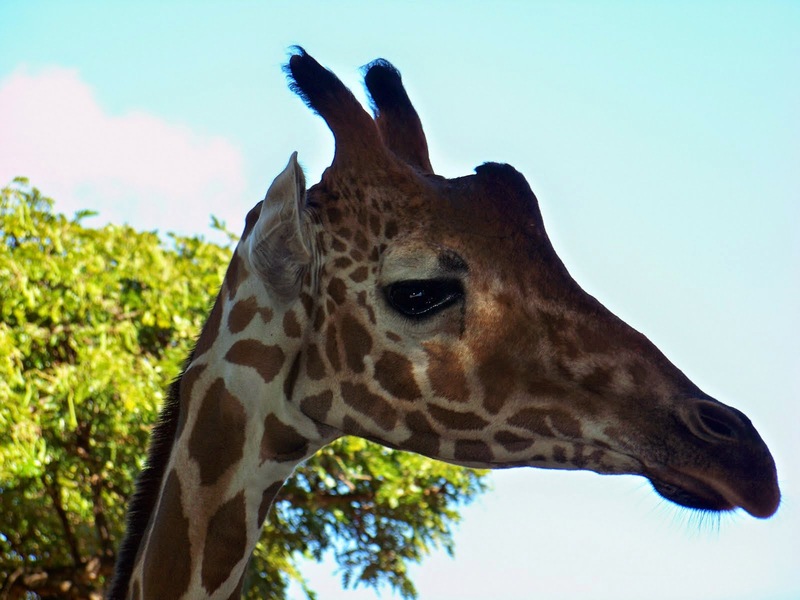 The Latin name came from the Romans, who thought the animal a cross between a camel and leopard (the camel marked like a leopard), or a camel wearing a leopard's coat. If you really want to track the word, check this out. Whatever, we've got a giraffe up there... and it might be host to a flood of shooting stars. Or it might just be holding up the sky... nobody is sure. It took sharp eyes to spot this one. I am endlessly fascinated by what we get to see in the world around us! Emma spotted this squirrel, and her comment was that it looked like it was carrying a sock in its mouth. Almost... That's Momma Squirrel. And she's carrying one of her babies. We tried to get some pictures as she hopped across the forest floor, onto and off of logs, and up the stump... But when she finally put the kid down, at the base of a tree, and said squirrel-let (more properly called a pup, or by some, a kit, just to confuse) unfolded and the pair of them went chasing up the tree -- on the wrong side for the camera! The frogs, however were equally determined to avoid having to take on Palatial consort duties with beautiful princesses, and proved to be quite elusive! Just when she thought she had all the stars aligned, the frog zipped away. We were treated to a chorus of the tree frogs in the pond behind this little creek though, while the hunt went on. Taffy offered her assistance, which as it turned out was less helpful than one might expect. Sophia's aunt Emma took on the role of papparazzi -- after all, if one of those frogs had found its way to Sophia's kiss, and had morphed into the handsome prince, we would definitely need pictures for the tabloids, would we not? We were delighted on Friday to have a visit from Emma Barker, and her niece Sophia, visiting from New Zealand. Emma was a Rotary Exchange student here 20 years ago, and rode one of our horses, Canadian Pride, in several local shows and events (taking home soooo many prizes, too -- and she tells me that she is still using some of that 'loot' in her own stable today. After all, brushes and buckets don't really age-out) It was lovely to get the chance to reconnect! In addition to checking out the deer on our lawn, the moose in Algonquin, and learning to canoe, Sophia painted with Napster -- she selected the colour palette, and he created the artwork with his tail. It's a lovely bright bit of cat art! So how about that? In one day, she met moose, and a cat who paints! It is always a happy day in the stable when the barn swallows return! This pair showed up on Thursday this week, and we couldn't be more pleased to see them. Time was, we'd expect to have three or four pairs nesting in the stables, and most welcome. They are, however, struggling these days -- although their tree swallow cousins seem to be doing quite well. The last few years, we've only had a single pair, and this year we were holding our breath in case we had none at all. We wish for them a fabulous nesting season, and four healthy hatchlings!